February 28, 1904: Barbara MacGahan died in New York. A native of Russia, MacGahan was the widow of a famous American war correspondent, and she became a renowned journalist in her own right. 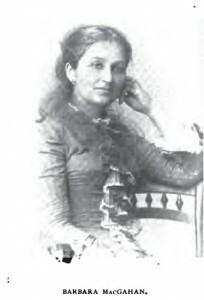 She was the principal founder of St. Nicholas Russian Orthodox Church (later Cathedral) in New York City, and she played an important role in the Russian Mission until her death. In MacGahan’s day, a disproportionate number of the Orthodox in America were men. And the status of women in turn-of-the-century America was certainly far more restricted than it is today. I mean, today, we don’t bat an eyelash at the thought of a woman chairing a parish council, but such a thing was probably inconceivable more than a century ago. It was in that world that MacGahan became a major player in the Russian Mission, right at the time when it was expanding beyond its original focus of Alaska. Barbara MacGahan may have been the most influential woman in the early history of American Orthodoxy. February 28, 1914: The choir of New York’s St. Nicholas Russian Orthodox Cathedral performed at the White House for President Woodrow Wilson. Some of the robes worn by the choir members at this event have survived, and are held at the OCA archives in Syosset, NY. Bishop Raphael was a master-builder. He laid strong enduring foundations, gathering a large constituency and acquiring valuable property for the congregation. He was a man of wide education and keen intelligence, a master of many languages. He possessed rare gifts of administration, and was unselfishly devoted to the spiritual and material welfare of his people. His death, in 1915, deprived the Syrian Church of a strong leader. February 28, 1937: The Ukrainian Orthodox Bishop Bohdan Spylka was consecrated by the Greek Archbishop Athenagoras Spyrou. UPDATE: In the original version of this post, I said that Fr. Alexander Hotovitzky returned to Russia on February 27, 1914 (so, the day before his cathedral choir performed at the White House). But my fellow SOCHA director Aram Sarkisian informed me that this was incorrect — actually, Hotovitzky was present at the White House concert, and he left for Russia on March 12. The reason for the error is that March 12 is February 27 according to the Old Calendar. We’ll make note of Hotovitzky’s departure in a couple of weeks, when we get to the actual anniversary. Also, I originally said that the choir concert was on February 29 (the date reported by other sources), but as Aram points out, 1914 was not a leap year. The concert actually took place on February 28.